Abstract: The gem of a processor operates at 1.6GHz and is based on the newer "Northwood" core which takes advantage of the 0.13 micron manufacturing process. Overclockers and enthusiasts have really taken a liking to Intel's Pentium 4 1.6A. The gem of a processor operates at 1.6GHz and is based on the newer "Northwood" core which takes advantage of the 0.13 micron manufacturing process. 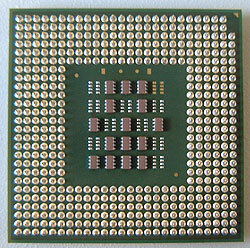 The small die size enables Intel to build much faster P4's running at 2.4GHz and even 2.53GHz. With that in mind, you have to wonder just how high the lower ranks of Northwood P4's can be pushed... the potential is definitely there! Because of its' longer pipeline, the Pentium 4 is slower clock-for-clock then it's arch rival the Athlon XP or even the older Pentium III processors for that matter. The P4 1.6A uses the quad pumped 100 MHz (400 MHz) FSB we're all used to, and this is capable of delivering 3.2GB/s worth of bandwidth to the processor. Now if you recall, the Pentium4 was stuck in limbo for quite some time when it was first released. 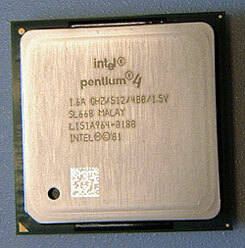 The processor was barely able to out-perform older Pentium 3 or AMD Athlon chips. This was a bleak time, and the early adoption of the chip was stymied greatly. Intel had always stated that the Pentium 4 architecture was built to scale high, and that performance would increase exponentially with clock rate, but there was still a problem. At that time the Pentium 4 was built with a 0.18 micron manufacturing process (first introduced with the Pentium III Coppermine) and this severely limited the ability of the core to ramp up to higher clock speeds. Maxing out at 2.0 GHz the Williamette (code name for the 0.18 P4 core) had reached its limit and something new would have to take over. AMD and their highly successful (and well priced) AthlonXP's were in the spotlight so Intel again uped the ante and introduced the Northwood core. With that release the tides have quickly turned - using a smaller die, Intel can now ramp up the clock speed of their P4's much higher, and at a faster rate as well. Now we are aware about the die shrink, the question turns to what differences exist between the Northwood and Williamette architectures? The obvious changes revolve around the size of the silicon core, changing from a physical size of 217mm2 to 146mm2. The transistor count has increased from 42 million to 55 million in the Northwood since more transistors can be squeezed into a smaller area. Really though, the transistor count difference is mainly due to the increase in the L2 cache size. Williamette based P4's have 256KB L2 cache and the Northwood P4's have 512KB in their L2. This increase in the L2 cache size is significant in several ways. With the larger L2 cache size, the Northwood P4 immediately receives almost a 10% performance boost over the Williamette based P4's of the same speed. Running on a smaller core means the voltage requirements are no longer as high and the voltage has been dropped from 1.75V (Williamette) to 1.5V. With the voltage decrease the Northwood-based Pentium 4 is more suited for the mobile market since it draws less power (for a Pentium 4 that is). With a die shrink and lower voltages, thermal properties also lower slightly. The Northwood Pentium 4 still has all the goodies that the Williamette P4 was introduced with namely the NetBurst Architecture, Advanced transfer cache and SSE2. To understand what those technologies do, please read our Pentium 4 1.5 GHz review.